GE has brought back Ellie the Elephant to appear in a television commercial focused on GE ecomagination technology. 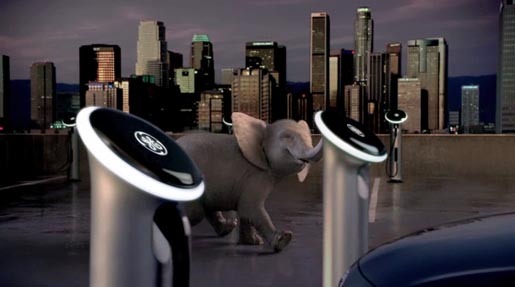 The CGI elephant, which first appeared singing in the rain in 2006, boogies through the jungle to an airport tarmac, an electric car charging station, a field of solar panels, a laboratory and a GE assembly line plant. Music is Louis Prima’s 1936 hit “Sing, Sing, Sing (With a Swing)”, recorded in 1937 by Benny Goodman and band. The Ellie 2 commercial was developed at BBDO New York by chief creative officer David Lubars, executive creative director/art director Don Schneider, copywriter Tom Darbyshire, executive producer Regina Ebel, agency producer Regina Iannuzzi and music producer Rani Vaz. Visual effects were produced at Framestore, New York, by VFX supervisor Alex Thomas, technical lead Andy Rowan-Robinson, lead animator Seth Gollub, lead Flame artist Mindy Dubin, nuke artist Sabrina Tenore, head of production Laney Gradus. Sound and music were produced at Sonic Union. Music was licensed through Platinum Rye.